Carefully following the maintenance schedule helps protect against major repair expenses resulting from neglect or inadequate maintenance and may help to increase the value of your vehicle when you sell or trade it. 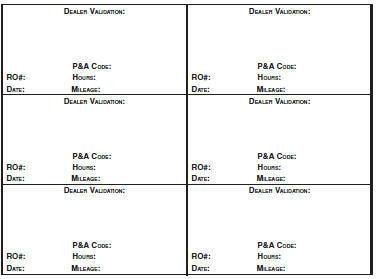 Keep all receipts for completed maintenance with your vehicle. We have established regular maintenance intervals for your vehicle based upon rigorous testing. It is important that you have your vehicle serviced at the proper times. These intervals serve two purposes; one is to maintain the reliability of your vehicle and the second is to keep your cost of owning your vehicle down. 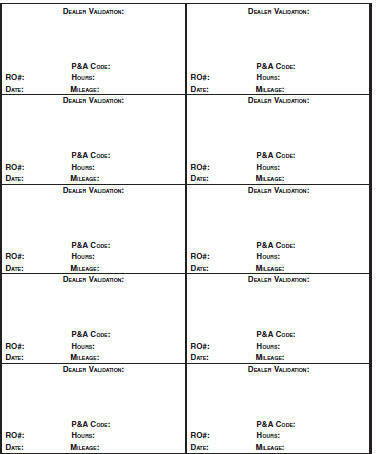 It is your responsibility to have all scheduled maintenance performed and to make sure that the materials used meet the specifications identified in the Capacities and Specifications chapter of this owner’s manual. Failure to perform scheduled maintenance invalidates warranty coverage on parts affected by the lack of maintenance. Why Maintain Your Vehicle at Your Dealership? Service technicians participate in extensive factory-sponsored certification training to help them become experts on the operation of your vehicle. 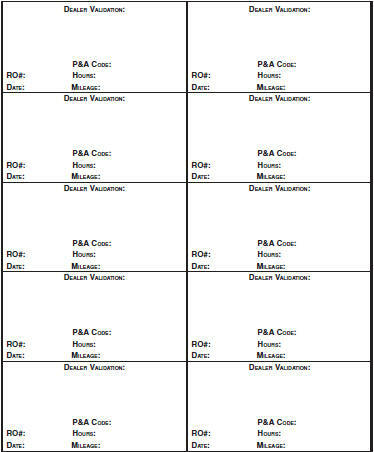 Ask your dealership about the training and certification their technicians have received. Dealerships stock Ford, Motorcraft and Ford-authorized branded re-manufactured replacement parts. These parts meet or exceed our specifications. Parts installed at your dealership carry a nationwide 12-month or 12000-mile (20000 kilometers) parts and labor limited warranty. If you do not use Ford authorized parts they may not meet our specifications and depending on the part, it could affect emissions compliance. Many dealerships have extended evening and Saturday hours to make your service visit more convenient and they offer one stop shopping. They can perform any services that are required on your vehicle, from general maintenance to collision repairs. Note: Not all dealers have extended hours or body shops. Please contact your dealer for details. Maintenance is an investment that will pay dividends in the form of improved reliability, durability and resale value. To maintain the proper performance of your vehicle and its emission control systems, it is imperative that scheduled maintenance be completed at the designated intervals. Your vehicle is equipped with the Intelligent Oil Life Monitor® (IOLM) system which displays a message in the information display at the proper oil change service interval; this interval may be up to one year or 10000 miles (16000 kilometers). When ENGINE OIL CHANGE DUE or OIL CHANGE REQUIRED appears in the information display, it’s time for an oil change; the oil change must be done within two weeks or 500 miles (800 kilometers) of the ENGINE OIL CHANGE DUE or OIL CHANGE REQUIRED message appearing. The Intelligent Oil Life Monitor® must be reset after each oil change; see the Instrument Cluster chapter. If your message center is prematurely reset or becomes inoperative, you should perform the oil change interval at six months or 5000 miles (8000 kilometers) from your last oil change. Never exceed one year or 10000 miles (16000 kilometers) between oil change intervals. : The Shelby® GT500® does not have an IOLM system; see your Shelby GT500 supplement for oil change service intervals. Your vehicle is very sophisticated and built with multiple, complex, performance systems. Every manufacturer develops these systems using different specifications and performance features. That is why it is important to rely upon your dealership to properly diagnose and repair your vehicle. Parts other than Ford, Motorcraft® or Ford-authorized remanufactured parts that are used for maintenance replacement or for the service of components affecting emission control must be equivalent to genuine Ford Motor Company parts in performance and durability. It is the owner’s responsibility to determine the equivalency of such parts. 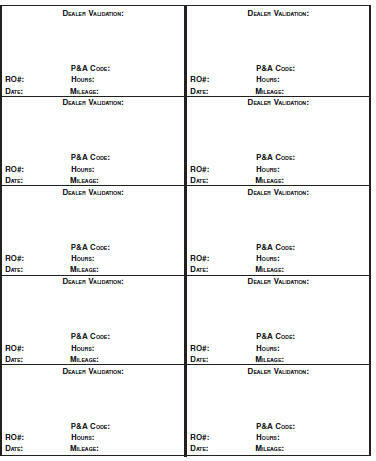 Please consult your Warranty Guide for complete warranty information. Ford strongly recommends the use of only genuine Ford, Motorcraft® or Ford-authorized remanufactured replacement parts because they are engineered for your vehicle. Ford Motor Company recommended additives and chemicals are listed in the owner manual and in the Ford Workshop Manual. Additional chemicals or additives not approved by Ford are not recommended as part of normal maintenance. Please consult your warranty information. In many cases, fluid discoloration is a normal operating characteristic and, by itself, does not necessarily indicate a concern or that the fluid needs to be changed. However, discolored fluids that also show signs of overheating and foreign material contamination should be inspected immediately by a qualified expert, such as the factory-trained technicians at your dealership. Your vehicle’s oils and fluids should be changed at the specified intervals or in conjunction with a repair. Flushing is a viable way to change fluid for many vehicle sub-systems during scheduled maintenance. It is critical that systems are flushed only with new fluid that is the same as that required to fill and operate the system, or using a Ford-approved flushing chemical. Certain basic maintenance checks and inspections should be performed every month or at six month intervals. In order to keep your vehicle running right, it is important to have the systems on your vehicle checked regularly. 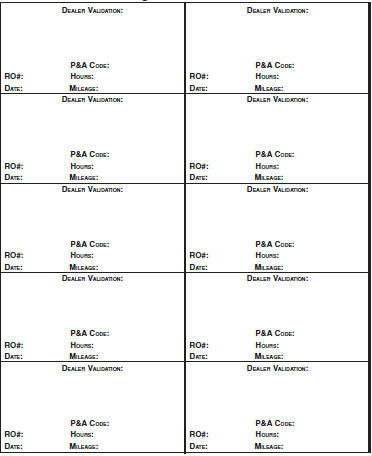 This can help identify potential issues and prevent major problems. Ford Motor Company recommends the following multi-point inspection be performed at every scheduled maintenance interval to help make sure your vehicle keeps running great. *Brake, coolant recovery reservoir, manual transmission, automatic transmission and window washer. **If your vehicle is equipped with a temporary mobility kit, check the tire sealant expiration Use By date on the canister. 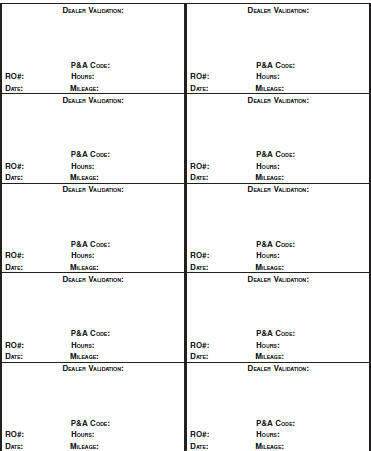 Replace as needed. Be sure to ask your dealership service advisor or technician about the multi-point vehicle inspection. It is a comprehensive way to perform a thorough inspection of your vehicle. 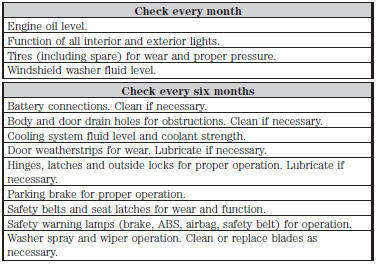 It is your checklist that gives you immediate feedback on the overall condition of your vehicle. You will know what has been checked, what is okay, as well as those things that may require future or immediate attention. The multi-point vehicle inspection is one more way to keep your vehicle running great! Your vehicle is equipped with an Intelligent Oil-Life Monitor® that determines when the engine oil needs to be changed based on how your vehicle is used. By using several important factors in its calculations, the monitor helps reduce the cost of owning your vehicle and reduce environmental waste at the same time. This means you won’t have to remember to change the oil on a mileage-based schedule; the vehicle lets you know when an oil change is due by displaying OIL CHANGE REQUIRED in the information display. 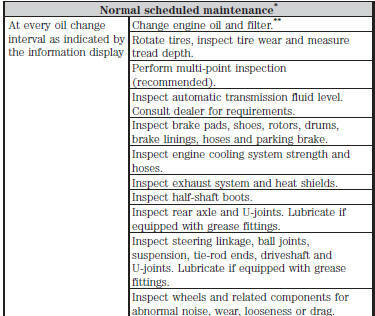 The following table is intended to provide examples of vehicle use and its impact on engine oil change intervals; it is provided as a guideline only. Actual engine oil change intervals depend on several factors and generally decrease with severity of use. : The Shelby® GT500® information display is NOT equipped with this feature. Refer to your Shelby GT500 supplement for oil change service intervals. *Do not exceed one year or 10000 miles (16000 kilometers) between service intervals. **Reset your Intelligent Oil-Life Monitor after each engine oil and filter change. See the Instrument Cluster chapter. 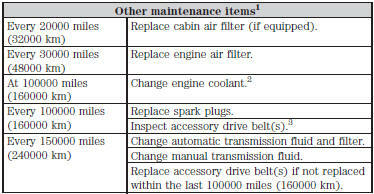 1These maintenance items can be performed within 3000 miles (4800 kilometers) of the last oil change. Do not exceed the designated distance for the interval. 2Initial replacement at six years or 100000 miles (160000 kilometers), then every three years or 50000 miles (80000 kilometers). 3After initial inspection, inspect every other oil change until replaced. Perform the services in the preceding table when specified or within 3000 miles (4800 kilometers) of the OIL CHANGE REQUIRED message appearing in the information display. : The OIL CHANGE REQUIRED message comes on at 28751 miles (46270 kilometers); perform the 30000 mile (48000 kilometers) automatic transmission fluid replacement. 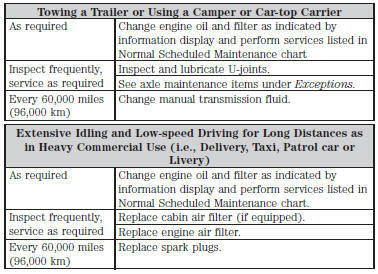 Normal vehicle axle maintenance: Rear axles and power take-off units with synthetic fluid and light-duty trucks equipped with Ford-design axles are lubricated for life; do not check or change fluid unless a leak is suspected, service is required or the assembly has been submerged in water. During long periods of trailer towing with outside temperatures above 70°F (21°C) and at wide-open throttle for long periods above 45 mph (72 km/h), non-synthetic rear axle fluids should be changed every 3000 miles (4800 kilometers) or three months, whichever comes first. This interval can be waived if the axle is filled with 75W140 synthetic gear fluid meeting Ford specification WSL-M2C192-A, part number F1TZ-19580-B or equivalent. Add friction modifier XL-3 (EST-M2C118-A) or equivalent for complete refill of Traction-Lok rear axles (see Technical specifications in the Capacities and Specifications chapter for details). Police/Taxi/Livery vehicle axle maintenance: Change rear axle fluid every 100000 miles (160000 km). Rear axle fluid change may be waived if the axle was filled with 75W140 synthetic gear fluid meeting Ford specification WSL-M2C192-A, part number FITZ-19580-B or equivalent. Add four ounces (118 mL) of additive friction modifier XL-3 (EST-M2C118-A) or equivalent for complete refill of Traction-Lok rear axles. The axle fluid should be changed anytime the axle has been submerged in water. California fuel filter replacement: If the vehicle is registered in California, the California Air Resources Board has determined that the failure to perform this maintenance item will not nullify the emission warranty or limit recall liability prior to the completion of the vehicle’s useful life. Ford Motor Company, however, urges you to have all recommended maintenance services performed at the specified intervals and to record all vehicle service. 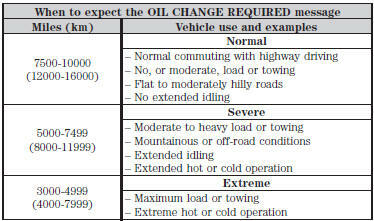 Hot climate oil change intervals: Vehicles operating in the Middle East, North Africa, Sub-Saharan Africa or locations with similar climates using an American Petroleum Institute (API) Certified for Gasoline Engines (Certification mark) oil of SM or SN quality, the normal oil change interval is 5000 miles (8000 kilometers). Engine air filter and cabin air filter replacement: Engine air filter and cabin air filter life are dependent on exposure to dusty and dirty conditions. 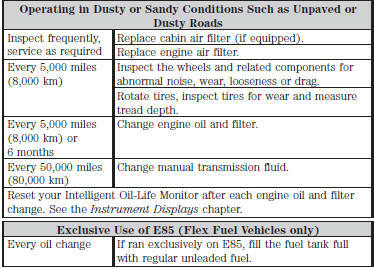 Vehicles operated in these conditions require frequent inspection and replacement of the engine air filter and cabin air filter. *Shelby GT500 owners: See the Shelby GT500 supplement.